Already given up on your New Year Resolutions? It’s only been 21 days. 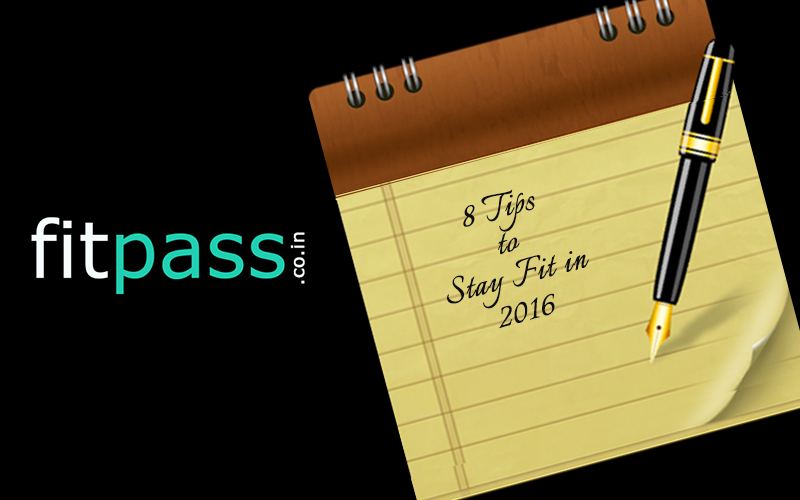 Let us help you get back on track these 8 Simple Ways to stay fit in 2016. 1. Quit the Elevators take the Stairs. We have all seen the ‘walk and talk’ advertisements and now it’s high time we should start implementing it. 2. No Pay Raises? Start doing leg raises! You’ve probably heard that you should drink water and about the benefits of drinking water, but how much is enough? The answer is ideally you should drink 8 glasses of water i.e. 2 litres of water in a day. If you are a man of your words and you are following your diet religiously then it’s good, not just ‘good’ it’s GREAT. But you can incorporate few things to cut your fat. 5. Enrol yourself in a Gym. 6. Create a Kickass workout playlist. 8. Plan when to cheat. A cheat day in a week is Okay! You can have that much mercy on yourself. Just plan it out. For instance, if there is an upcoming birthday in the week, or a wedding party, then it is best to cheat on that day. Plan your meals ahead of and after that day.